Congratulations to Crystal - you win the notecards. Please email us your address and we'll get that right out to you. Thanks all for playing - have a wonderful and safe 4th! The June Bug Collection from Basic Grey - coming to your local Beverly's soon! 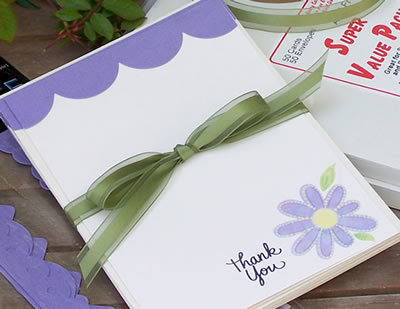 to you scrapbook layouts and papercraft projects. Ok, so it's the end of the month, and we're ready to "giveaway" one of our June how-to's. It may seem early, but us crafters know it's never too early to start thinking about the holidays. So we want to know .... have you started your holiday crafting yet? or maybe you're in the planning stages. Leave a comment telling us what your working on or plan to work on for the coming holidays and we'll have a drawing for a set of six thank you cards made by our very own Kathy. Drawing will be held on friday ..... good luck! Kid's Can and New How-to's! 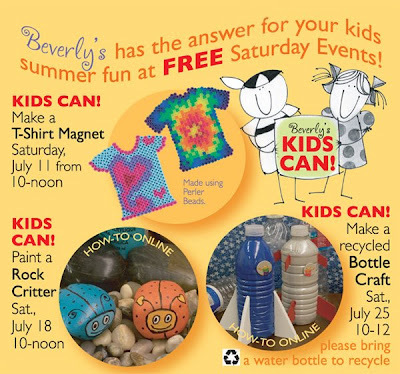 July is Kid's Can Month, which means we're having some FREE Saturday Events coming up. You can find the "how-to's" for the Rock Critters and Water Bottle Rocketships here along with other new projects.